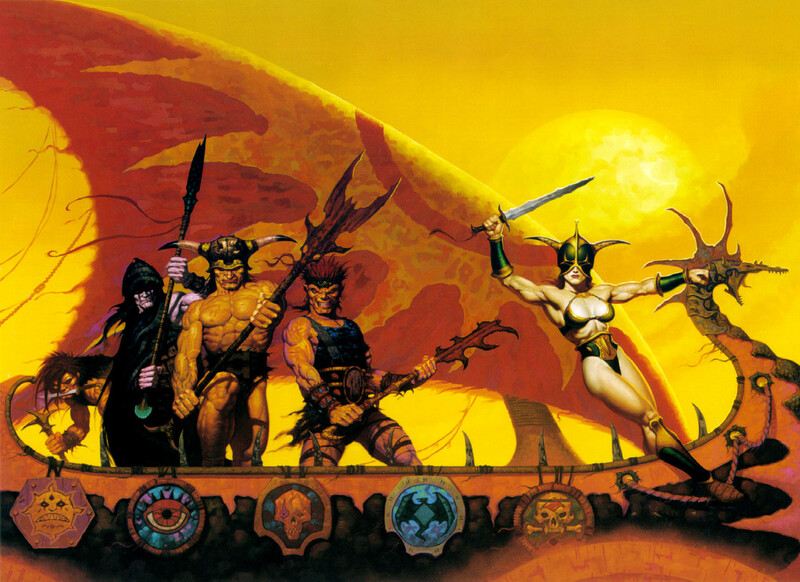 While the core books will not be out until August, we have been told there will be no new classes for Dark Sun. There will be new races (Mul, Thri-Kreen) and the previews at the D&DXP convention and for D&D Encounters give us some ideas of what to expect. Some of this blog (otherwise based on the previous editions) could be different. I have done my best to stick to common concepts that are not likely to change and tried to note potential changes where possible. The incredibly lethal Athasian landscape and the history of brutality and harsh change have all combined to greatly change the races from other settings. A dwarf in the Forgotten Realms and in Greyhawk have a few cultural differences, but are fundamentally the same. An Athasian dwarf is really very different, both physically, mentally, and culturally. There are also some new races and some of the common races do not appear (or, in 4th edition, are probably just more rare – for example, gnomes were exterminated by one of the Sorcerer Kings). (Judging by the art in earlier editions) The Athasian dwarf often has less hair. Beards are not all that common. The Athasian dwarves once had large communities, but those were torn apart by war in ages long past. There are only a few dwarven villages scattered across the Tyr region and none of them resemble the dwarven mountain homes of other campaign worlds. Dwarves on Athas are largely surface dwellers. Dwarves are still incredibly tough and resilient people. What makes an Athasian dwarf unique amongst the races is the concept of the Focus. Each dwarf grows restless without a Focus to follow. This must be a project or goal that will require extended effort to complete. Many will last a lifetime. It is said that a dwarf that strays from their focus and dies will become an undead banshee and haunt their unfinished work. When role-playing a Dwarf, consider what an appropriate focus will be. Ideally it will take some time to complete, guide your PC’s motives, but still allow for the flexibility an adventurer needs. Or, maybe you are straying from your focus… how does the risk fray your sanity? Perhaps one of the other PCs is needed for your focus? When you meet a dwarf, you should be wary of the possibility that your actions may interfere with a focus. This could be very dangerous. A visit to a dwarven village can be very interesting if the village is focused on a single task. Elves are true outcasts, mistrusted by most Athasians… and for good reason! Elves are typically nomads, always on the move and never staying in one place for long. A large number of these nomads are raiders, praying on travelers as they cross the wastes. Many of the more unscrupulous merchants in the cities are elves. The famed elven markets often sell items that the sorcerer kings control (such as ritual components) and may offer items at a discount, but they can just as often be a trap that leads the unwary buyer into a death in a dark alley. Elves are known for being loyal only to their own tribe – they may steal even from other elves! Elves are also survivors. Few know how to survive in the deserts as well as elves. And, few can run as fast as the swift elves. Slave traders may not bother with elves, for they are hard to catch. Worse, elves often die in captivity. The elves believe in living life to its fullest every day. They live in the present. As they say, they try to enjoy “every now“. The future is dark, and only if the present can be enjoyed is life worth living. This makes many of them big hedonists, as well as lazy – why work when you can play? Elves are hairless other than atop their scalp. They are tall and thin, with long limbs. They are generally in excellent condition. Their skin is usually dark and tanned from exposure to the sun and ragged from the wind and sand. An elven PC must consider how they will deal with these stereotypes (and to what extent there may be some reality to them). Is your PC the kind that would turn on the party if conditions are right? (Note: D&D is a lot more fun if you never actually do that, but the concept can make for great RP). Is your PC lazy? Are they wild, looking for the next party? What happened to your tribe? Were they raiders, herders, merchants? Did you live in a city, working an elven market? If your PC meets an elf, how much will you trust them? Do you look forward to visiting an elven market, or would you never visit such a place? Do you think of them as dangerous raiders or as a companion with which to party and enjoy life? Humans are the most common race in the Tyr region. They tend to be more fit, slightly taller and heavier, and hardier than the humans in other campaign worlds. Their faces and skin show the ravages inflicted by desert wins, brutal cold, and searing heat. Their adaptable and clever nature have allowed them to survive despite being weaker than some races. The Athasian past has also gifted them with positions of power. Most of the ruling class and nobility in cities are human. Athas has a xenophobic past, though many ages ago. The xenophobia has largely past, but the social stratification remains. In addition, humans have some of the most iconic cultures. Each of the cities of the sorcerer kings has a very different culture (more on this in a future blog!). Humans are often defined culturally by their city of origin and show certain mannerisms, beliefs, allegiances, and physical features based on this. If your PC is human, do they enjoy a higher social position, or did they enjoy one once? With so many different cities, which one has impacted their culture the most? Is that city your home base, or have you moved away for some reason? Are you loyal to one city? How do you view those in power? (It is unclear if this will remain true in 4th edition, but in previous editions) Half-Elves are often shunned by humans or elves. Elves may not allow a half-elf, who has only one parent from their tribe, to retain membership. Similarly, humans may distrust the half-elf. Because of this, half-elves often try to prove themselves to both races, trying to fit in whenever they meet groups of humans or groups of elves. Physically they tend to be a little taller than a human, slightly heavier than an elf, and retain some of the facial characteristics of both, such as slightly pointed ears or some facial or body hair. As with humans, the city of origin may be important. Or, perhaps it is a tribe of origin that has influence on your half-elf PC’s past. A half-elf PC must consider the importance of trying to fit in – do you chafe under the desire or does hit help make you a natural at diplomacy and a bridge between different races? When meeting a half-elf, it may be worthwhile to see if one half is stronger and whether the wish to be accepted. Failing to understand this may insult them deeply. Halflings, it is said, once ruled the world. And yet, it is hard too believe, for halflings are usually feral savages that hunger for the flesh of any sentient creatures other than their own kind. Short but with incredibly strong bodies, they bear the faces of beautiful wise children. They have many detailed customs and traditions which they share with other halflings. Most retain a love for the world, though it can show in different ways (perhaps since the landscape is so desolate and damaged). Halflings see other races as uncivilized and many shun normal concerns. They instead prefer to find balance in their ways and in finding harmony with the environment or their kind. Few can live for long enslaved. When meeting halflings, or when playing one, it is important to determine how their feral nature manifests and how and when their more cultured side manifests. These should not be in conflict, but rather are based on the situation at hand. A halfling may meditate in peace with their kind upon seeing a beautiful ravine, then turn on humans that enter it assuming they will despoil it. Only magic could create such an incredible creature posessing some of the incredible strength of Athasian giants (who generally live on islands in the Silt Sea). They stand some 10-12′ tall with exaggerated human features (such as a pronounced forehead, bulging muscles, or very large knuckles). They did not seem to inherit the cunning of their human side. As a race they are seen as dim-witted. However, they can be gentle warriors, often being kind and eager to learn from others. They are also often curious, and many times will seek someone to emulate or follow. Lacking a culture of their own, many adopt one from their surroundings. Their size and personality leads many to seek employ as guards and laborers where they can follow orders. PCs may want to consider how readily they will try to emulate others and how easily they are led “off track” by NPCs and PCs. It can be a lot of fun to take after the original boxed set, where each half-giant chose one portion of their alignment to be fixed; the other side would change each day based on who they encountered! Other races should not be too quick to judge a half-giant. They can make for good friends. At the same time, their incredible strength and fickle nature bears watching should someone charismatic come along! There are no pre-generated half-giants in D&D Encounters, but the rules use the Goliath for the racial rules. On Athas, when a dwarf and a human mate a Mul is the result. Like half-giants, Muls are often bred for war and service. Unlike half-giants (who came from magical means but can now produce offspring), Muls are sterile, only occurring from dwarves and humans. Muls are as tall as humans but far stronger and with the endurance of the dwarven race. They tend to have bulging muscles, prominent eye ridges, and ears that come to a point and tilt back. Muls usually lack hair anywhere on their bodies. Because of their strength they are seen often in gladiatorial arenas and slave pits. However, they can be independent and fierce fighters. Thus, their handlers have to go to great lengths to keep them productive and content. Many Muls nonetheless escape into the wastes, where they sometimes lead tribes of escaped slaves (many of which become raiding tribes). If you play a Mul, how do you balance your violent and independent sides with the needs of the adventuring party? Are you an escaped slave? An ex-gladiator or laborer that somehow won freedom? Perhaps you served a noble or were raised by dwarves (which is unusual). When meeting a Mul, be careful of the challenge they prevent, both with their strong opinions and their dangerous physical prowess. Thri-Kreen are cunning six-limbed insectoid creatures. They resemble a praying mantis, but are about 7′ tall at the shoulders and about 11′ in total length. Thri-Kreen are most common in the wastes, where they feel at home. One of their greatest joys is that of the hunt, which they cannot easily practice in cities. Though they will eat sentient races, they generally prefer not to eat those with whom they live or travel. They often shun most possessions and need no sleep. Their language consists of a series of strange clicks and clacking noises. Their long legs allow them to be excellent jumpers. They are truly alien to most other sentient creatures. However, the thri-kreen also have a strong need to have a pack. When they find themselves alone they quickly work to identify a suitable clutch they can care for and then become very loyal to their packmates. Unfortunately, this usually comes after they try to dominate the group in an effort to establish who the dominant member of the pack is. Once this is established, the packmates are friends for life and will always be protected. Thri-Kreen are very dangerous opponents. They can attack with all four limbs, each of which ends in three fingers and a thumb. They are fast, can leap, and have a hard shell as natural armor. Some have a poisonous bite. Many are proficient in strange weapons, such as a crystalline throwing wedge called a chatkcha or a two-bladed pole-arm called a gythka. If you play one, consider how to best emulate their alien nature. Do you tilt your head from side to side or clean/preen yourself the way a praying mantis does? Do you make clicking noises? How well do you speak common? How will you attempt your dominance of the party and how quickly will you yield to those that are stronger? Do you like the taste of some sentient species? Do you use traditional weapons or favor others? How do you react to being in cities? Other races found in 4E may be found on Athas as well. In ancient times a magical tower and the work of the sorcerer-kings created many races. Those playing races that are rare on Athas may lack a defining culture and thus may be shunned by others. They may, however, have found a way to fit in or perhaps are part of a small community of their kind. (We should note that previous editions included Pterrans and Aarakocra, but those races are found outside the Tyr region and may not be covered anytime soon in 4E). The Dray are an example of this. Richard Baker talks in his WotC blog (Note: no longer available online) about how WotC decided to recast Dragonborn as Dray. Dray are a race of creatures created by Dregoth, an undead Sorcerer-King. Dregoth lives in secrecy, known to very few, and constantly plots from his ruined city of Giustenal. He is incredibly powerful. He began to toy with humans, trying to transmute them into a race of dragons. The first batch was twisted and imperfect (and Dregoth banished them), but the second generation resemble a majestic dragon king. The first generation both revere and hate the father that cast them out, while the second generation enjoy positions of power. The first distrust surface dwellers, the second outright hate them – for they are part of an army designed to someday restore Dregoth to power over the other city-states. So, when RPing a dragonborn/dray, consider which batch you might come from and how you escaped that group (normally very close) to become independent and an adventurer. When playing a different race, consider how you choose to fit in, what alliances you have made in the past, how you deal with mistrust, and what has helped create a sense of culture or identity. Of the pre-generated characters for D&D Encounters, one of them is a Tiefling. There are no (or at least few) planar gateways on Athas, so it is unlikely that the tiefling has an ancestry tied to outsiders. 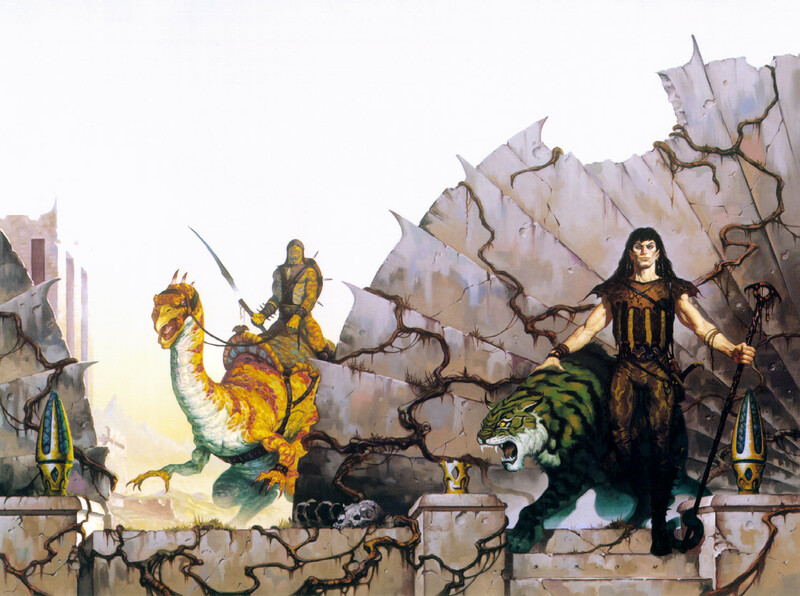 Instead, a tiefling may be the result of creatures that dealt with the sorcerer-kings, or even with Rajaat, the legendary (and evil) being that caused much of the devastation on Athas. There you have it! We have covered the major races and also mentioned which races will be found in D&D Encounters. I spent a lot of time on races, but now we turn to the classes and themes we see in D&D Encounters. I am also eager to cover the various city-states! This entry was posted on October 2, 2015 by Alphastream and tagged 4E, Backstory, Character Building.